Luton’s record-breaking season will mean little to defender Sonny Bradley if they don’t go up this season. The centre half has seen his club set a new best of 25 Football League games unbeaten, breaking the 20 that had been set twice before. Everything we’ve done so far this season, it’s all good, but we’ve got to finish the job, we’ve got to be on it every single game. 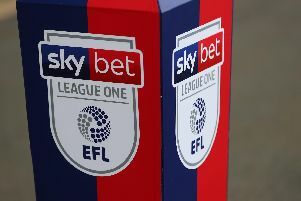 Tuesday night’s 1-0 win at Bradford also meant they are now 12 Football League matches unbeaten on the road, surpassing their previous record of 11. However, Bradley said: “Records are nice and a lot of people are mentioning them and it’s fair play, credit to the boys, we’re doing well, but the main goal is getting promoted. “That’s what we’re focused on and probably because we are so focused on that and not getting beat and conceding goals, the records come with it. “Everything we’ve done so far this season, it’s all good, but we’ve got to finish the job, we’ve got to be on it every single game. 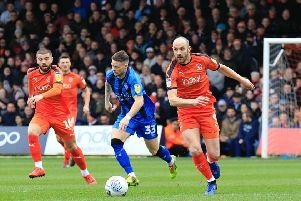 Striker Danny Hylton was of a similar opinion to his team-mate, admitting the players haven’t been getting too bogged down in setting club bests this term. Speaking after the 2-2 draw at home to Gillingham on Saturday, he said: “We’re aware that we’ve set a record, but honestly, the team are not arrogant, they’re humble lads and we just take care of the next game. “We don’t get too high when we win, there’s not been too many losses, but we don’t get too low. “Today, we drew the game, we were a bit down, but we quickly had a chat in the dressing room, looked at the facts, and the facts are that there’s eight games to go and we’re five points clear, so what’s there to be down about? “We’re extremely proud, but we quickly refocus and move on to the next one and I think that’s the great thing about this team and this squad. “We’re not getting too excited about records and being unbeaten and being top of the league. We win a game and it’s pat yourself on the back, shake each other’s hands and then we move on, new week, new game to focus on. On the club record of away matches, team-mate Andrew Shinnie added: “That’s another thing to be proud of. “It’s great to be that hard to beat, to be part of a team that’s hard to play against as that’s what we work hard on at the training field. “Our shape, the way we press, it all comes to fruition on a Saturday.